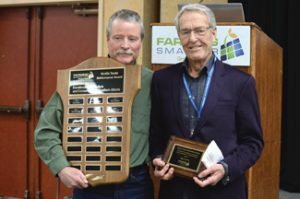 The Orville Yanke Award, (established by the family of the Medicine Hat area farmer who did so much to get Farming Smarter off the ground to recognize those in agriculture who have contributed greatly the conservation throughout the years), was given to farm activist and no-till pioneer Ike Lanier. Lanier is co-owner of Neveridle Farms just south of Lethbridge. He was one of the original farmers arrested and jailed for defying the Canadian Wheat Board monopoly in the 1990s. He was later pardoned by the Harper government. Lanier gave a moving address about his pride in seeing no-till agriculture become the established norm in farming community, but also showed he still had some fire in his belly on the political side of the equation as well. Here are his remarks in full. “Thank you for this honour, and I accept it humbly and with gratitude on behalf of so many other farmers who love the land, and who have done what we could to look after it” said Lanier. “I did not know Orville well, but well enough to know he cherished the soil he farmed, and appreciated what soil means to civilization. I would like to propose a toast to Orville and his family. To the bequest of Orville’s family for the sake of the soil. I have been farming for 60 years. I could never have imagined the farming landscape of today. Not long ago I drove through stretches of southern Alberta dryland, and was amazed and thrilled to see mile after mile after mile of untilled fields growing all kinds of different crops. And best of all, no one acre of fallow. That’s a practice that was deemed essential for decades and decades, and now not really needed anymore. “The land has been transformed completely and irreversibly. The winds that blew black dust have cleared, and the damage to the land has mellowed, and the wounds inflicted by past misuse are healed. I was fortunate to farm close to the federal research station in Lethbridge and the provincial station. Soil scientists succeeded in raising the awareness of the level of the continental problem of soil degradation. Agri-business recognized the opportunity and revised the system. We all benefited and prospered. Today’s young farmers are perhaps the first generation on the prairies that can think about improving the soil rather than just conserving it. We have seen great profusion of new crops in recent years. Crop diversity will increase, crop rotation. With each crop given a different chemical regime to help slow down herbicide resistance. Using all our options in synchrony to do to the land of each farm is another example of farming smarter. “The demise of the Canadian Wheat Board has opened our eyes to allow new opportunities, but also some responsibilities. How do we respond to shifting demands through market forces from consumers and policy makers who are disconnected from the land? I have always been skeptical of that old adage: The customer is always right. I would be happy with sometimes, or often. I’m on a soap box so I am going to offer my opinion on the proposed carbon tax. As reduced tillage has expanded across western Canada, by 2008 farmers had already stored nine billion tonnes of carbon in the soils for future crop production. This is remarkable. The amount of carbon stored increases every year. So the question remains: Should agriculture be taxed? Although we cannot stand aside, letting someone else shape our future. That is not option. Farmers have earned a place at the policy table. Ike Lanier (right) receives the Orville Yanke Award at the Farming Smarter conference in Medicine Hat. The award was presented by Rob Runne on behalf of the Yanke family.